This game features two teams who won in the opening round of fixtures so we are guaranteed to have one team with a 100% record going into game three in Group B. 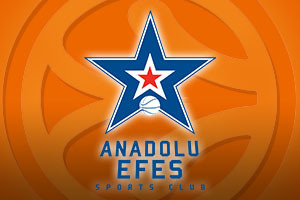 The history books will indicate that a home win is likely as Efes hold a 10-0 record against Milan in Istanbul but on the other hand, there will always be people telling you that records are there to be broken. Efes were on fire in their opening game, away to Limoges CSP, and they had six players breaking into double figures with respect to scoring. Add in the fact that Thomas Huertel served up 15 assists, close to a record-breaking amount, and you have a team who hit the heights. It will be a tougher task in the Thursday night clash with Milan but there is no reason why the Turkish side cannot prevail in this game. With Derrick Brown boasting of at least one steal in the last 14 Euroleague games he has played, there are plenty of big name players on the court for the hosts. Then again, the Italians have plenty of players that can decide a close game. The opening round home win was a close game for Milan, but it shouldn’t have been so tight. Milan nearly blew a massive fourth quarter lead but they just about held on, and that’s the key thing to remember from the game. Jamel McLean and Alessandro Gentile were the key performers in that win, and you should look for these players to be at the heart of what Milan try and do in Turkey. Gentile has a record of reaching double figures in his last 11 Euroleague outings, so you can bet that he’ll be keen to continue this form. 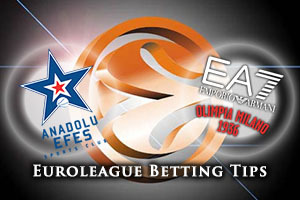 The hosts are the favourites for the match and taking Anadolu Efes with a -7.5 handicap, at odds of 1.90, is likely to be a good way to enjoy the game. In the Over/Under market, you should look to go OVER 153.5 at odds of 1.90. Bet Now!